Teaching and learning processes involve a lot of ingredients to make imparting knowledge and skills from one person to another effective. Teacher, teaching aids, methodology, planning and strategies are some of those ingredients. In their absence, teaching and learning processes are negatively affected. Basically, teachers’ knowledge and skills are the main things for a successful teaching learning. No doubt, availability of resources and sufficient teaching aids and materials play a significant role for effective and successful learning. Lack of such resources inevitably creates a lot of problems derailing the learning process. In Nepal, there are many schools which lack physical infrastructure, trained teachers, and other resources required, But this does not mean that teaching learning activities do not take place effectively. Many schools have teachers who have taken teaching profession for their passion. They have been carrying out teaching learning activities more effectively and successfully even in the absence of such resources. They have proved the fact that it is the teachers who can be the world in the classroom to their learners. I am writing to share a story about one of my teachers who taught very effectively in spite of lack of resources. After being in the teaching profession for more than four decades, essentially his entire professional life, he is now retired. But he remains a major source of inspiration for me. I was unaware of how important the teacher’s knowledge and skills can be while I was in school. BUT now when I myself am teaching after completing under-graduate studies, I realize and I could not help myself thinking of Ridhhi Kant Singh Thapa, my English teacher from Trijudhha secondary school in Birgunj. I can still remember his teaching style as quiet different from others. Mr. Thapa was really passionate about teaching and that was perhaps the most important reason for why he was such a successful teacher. Inspired by his teaching style and classroom procedures, I would like to share with the audience some of his key teaching tips and techniques that had overwhelming impact on the learners through this short blog post. I can still recall when he entered into the classroom, the environment changed automatically and there was active participation of students. Every student was enthusiastic about reading the text again and again. At the end of each lesson, we all were busy in making the questions ourselves and writing their answers accordingly on our own. My teacher usually wrote some examples of making questions to help the students who were weak and his individual attention to such students increased confidence and habitué of reading and writing. While teaching passages and stories, the way the teacher adopted was very impressive and interesting to improve reading and writing skills. Here is a series of activities he used in the classroom and they have been presented in a process flow. First, the teacher [T] selected some reading text ‘passage’ or ‘story’ or ‘dialogue’ from the textbook. He further informed the students [Ss] which text they were going through. Secondly, T made Ss read the text themselves and asked to make questions as many as possible while reading the same text. After that, T asked Ss to note down the answer of the questions they had made while reading the text. In the meantime, T wrote some structure and examples on the board so that Ss would feel easy to do their task. He helped Ss with difficult word meanings in order to comprehend the text clearly and write the correct answer of the questions. Then, T asked Ss to exchange their notebooks with their partner in a pair. After they had reviewed the answers written by their friends, they had a discussion and checked the answers of their friend’s notebook in pairs correcting their mistakes. T asked Ss the number of the questions they had made and asked them to find the student who made more questions. T was more interested in finding out which question Ss found hard to formulate and answer. Through this activity, he came to know where they were facing problems and where they required his support. It helped him come up with proper solutions helping Ss understand the text better. Then, T wrote all the questions on the board asking Ss one by one from the same list which they had prepared while reading. Similarly, he approved the answers they had prepared asking them in turns. At the end, T knew how well Ss have understood and comprehended the text and if they are found missing something or clarity required, he was always forward looking to take possible steps to fulfill the gaps. This is how he was successful in making the lesson interesting and effective. It is a learner centered method. It increases confidence level of learners and enhances both of reading and writing skills. Even untrained teachers can easily carry out this procedure and can get control over the large class-room. As inspired by my English language teacher whom I have lots of respect for because of his uniqueness and successful teaching career, I have shared the above mentioned teaching procedure hoping it could be beneficial and useful to those teachers who are compelled to teach due to lack of teaching materials and resources required. 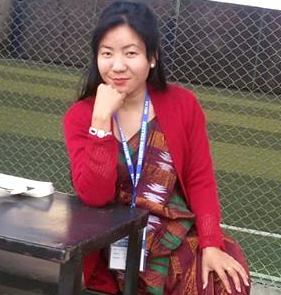 Miss Tiwari is an undergraduate in ELT from Tribhuvan University and preparing for her masters’ degree. Currently, she is working as Radio Jockey for Radio Bindas in Birgunj. Yes, Jyoti Ji you are right. The ELT professionals who are passionate on their profession and wanna do something new are always in our heart and mind. This is the reality that we people have in our student life. And the tips they did at the time they taught us will be the guiding paths in our life in the days to come. Frankly speaking, those tips will be the inspiration to us to cultivate our mind and to invest in the profession we involve. I have a similar experience to this. I remember the tips of my inspiring teacher every time when I as a teacher in a private school of Morang district (Mount Everest Sec. English School Morang) entered the class. I tried my best to apply/supply his inspirational tips in teaching my very dear students. It was the tips that made me a leading teacher among more than twenty-five teaching staffs. On the other hand, there are some teachers who never come in our heart and mind even we try our best to remember them. I don’t know whether the teachers themselves are responsible or we people are responsible for this but I with the experience know and claim that teachers themselves are responsible to develop as inspiring teachers in their profession with thousands of jolly minded kids(students). The teachers who are working in ELT as a teens-biker are never remembered and have made ELT a virus-infected laptop which neither deletes outdated teaching traditions nor installs new updates for developing quality manpower for the nice motherland. Thank you for sharing Thapa sir’s simple and practical teaching. In fact, good teaching is timeless.